Lois Lerner, Ex-IRS Official, Invokes 5th Amendment Again : The Two-Way Lois Lerner has been at the center of a storm over the targeting of conservative groups. She wouldn't answer a House committee's questions. Then the panel's GOP chairman and ranking Democrat sparred. 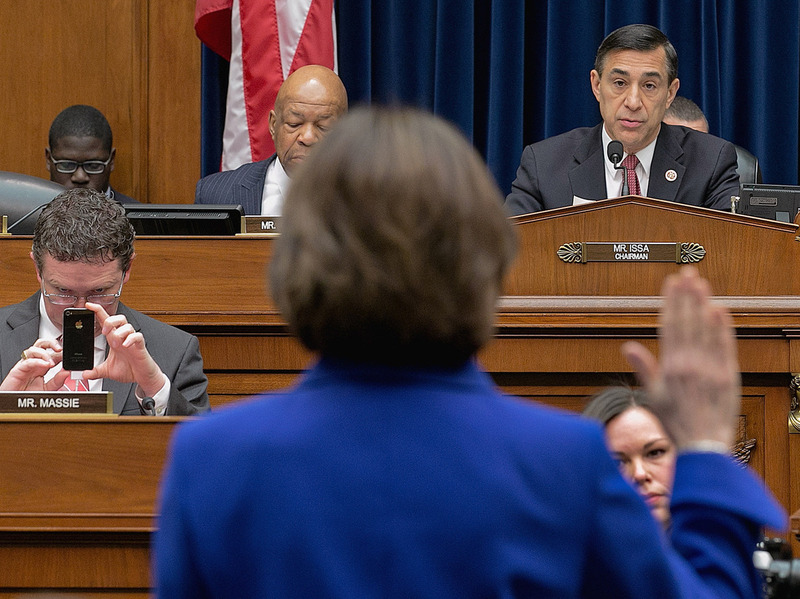 Former IRS official Lois Lerner raises her hand as she's sworn in Wednesday at the start of a House Oversight & Government Reform Committee hearing. She declined to answer questions posed by Chairman Darrell Issa, invoking her Fifth Amendment right. As she's done before, the woman at the center of the political storm over the Internal Revenue Service's targeting of some conservative groups from 2010 into 2012 invoked her Fifth Amendment right not to answer questions during a brief appearance before a congressional committee on Wednesday. "On the advice of my counsel, I respectively exercise my Fifth Amendment right and decline to answer that question." Issa eventually gave up. "Ladies and gentlemen, seeking the truth is the obligation of this committee," he said. "I can see no point in going further. I have no expectation that Miss Lerner will cooperate with this committee." With that, the chairman brought down his gavel and adjourned the hearing. That's when things got hot. The panel's ranking Democrat, Rep. Elijah Cummings of Maryland, asked to speak, saying, "You cannot run a committee like this." Issa had Cummings' microphone shut off. "I want to ask a question," Cummings could be heard saying. "What's the big deal?" At that point, Issa had the microphone turned back on. But when Cummings began making a statement about what he sees as the unfairness of the Republican-led committee's investigation, Issa had the microphone shut off again. "We're adjourned, close it down," Issa said. "I am a member of the Congress of the United Sates of America!" Cummings shouted. "I am tired of this. ... You cannot just have a one-sided investigation!" Moments later, Issa left the hearing room. Cummings kept speaking. C-SPAN's microphones in the room picked up his comments. As you'll likely recall, the IRS first came under fire last May when Lerner — who at that time led the agency's division that oversees tax-exempt groups — apologized to conservative organizations that had been singled out for extra scrutiny. Many of those groups had complained about delays in their applications for tax-exempt status. She spoke just ahead of a report from the Treasury's inspector general for tax administration about the agency's activities — a report that concluded some conservative groups had been "deliberately targeted." (Democrats have released IRS documents showing liberal groups also came in for extra scrutiny.) A political furor erupted, eventually leading to the resignation of the agency's acting director. Lerner retired from the agency later in the year. Last May, Lerner was called before Issa's committee. That's when she first invoked her Fifth Amendment right. -- The Republican-led House Ways and Means Committee continues to hold hearings and request documents from the agency. -- The Democratic-led Senate Finance Committee, as ranking Republican Orrin Hatch of Utah has said, "continues to work in a bipartisan fashion to investigate what happened, and we hope to conclude this investigation in the near future."